Okay, so the funny thing is that I don’t actually have a “celebrity crush”, per se. However, I am a music junkie and I have a special weakness for punk musicians, which is why the A Muse Rockstar stamp is one of my all-time favourites. 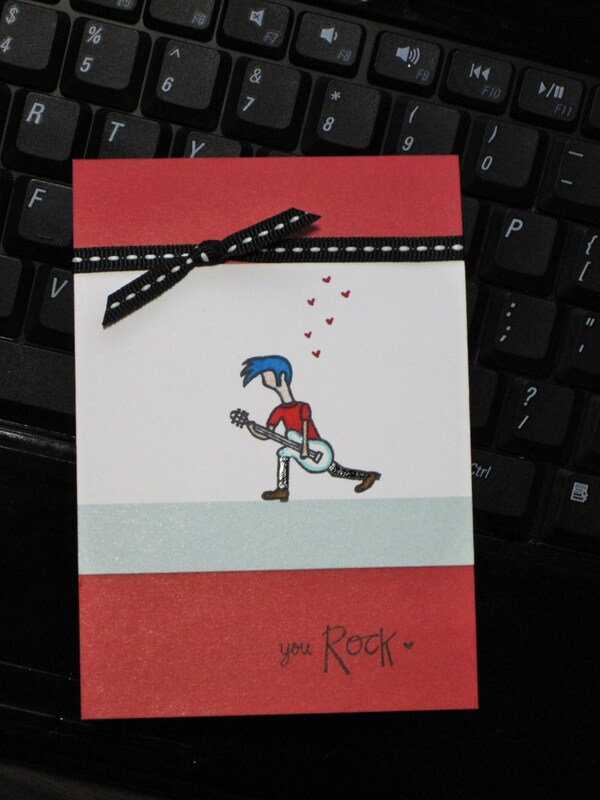 Can you believe I don’t own the “You Rock” stamp?! I was shocked, but I improvised. I used my Black Gelly Roll Glaze pen to give the Rockstar some leather pants. I’ve got four more cards up my sleeves, as the challenges are revealed over on the lounge – so keep checking back over the next two hours! what a great card…love love love the black leather pants!! Love the blue hair, the pants, and the little hearts – he’s a real heart throb, isn’t he!